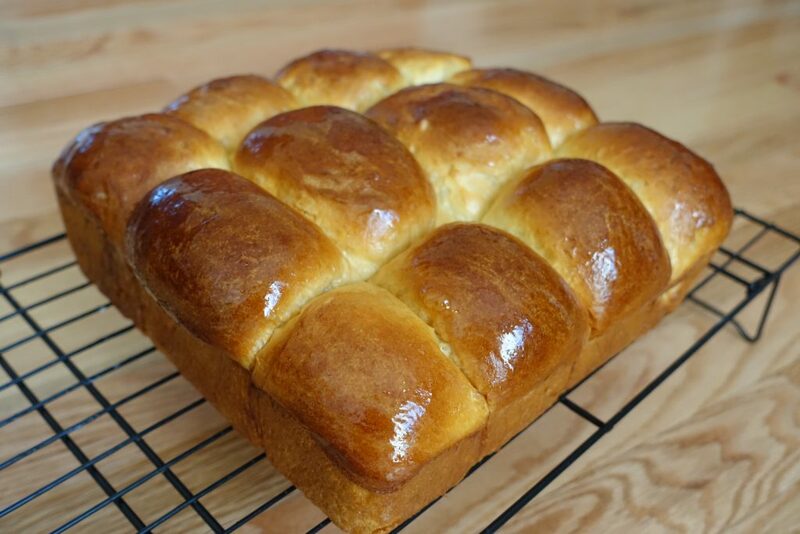 I have been searching the net for a recipe to resemble specific rolls dating back to early 70’s, as per my memory of summer camps in Ellenville, NY. 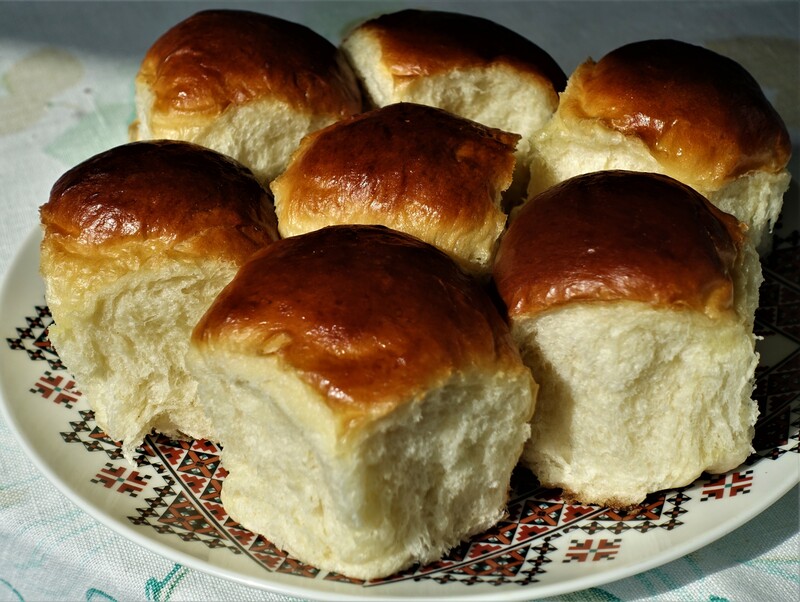 Mrs. Kormeluk was the cook at that time, so rolls similar to these were made daily, and served with a cup of cold milk, as an afternoon snack for all the campers. 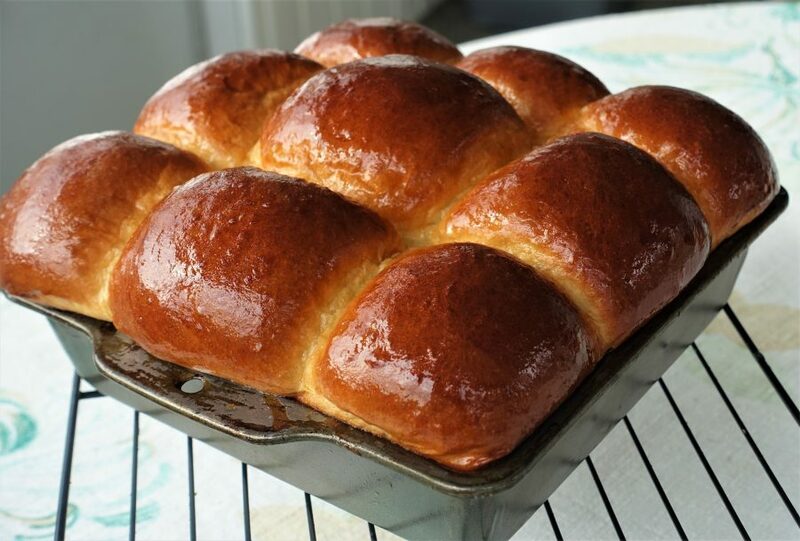 I have tried several recipes, and tested the texture and flavor of these rolls with my children, who also were lucky enough to enjoy the same snack at the same camp, in the 90’s, but by that time, these were baked by Mrs. Tinio. Neither of these ladies are baking at the camp kitchen any longer, and unfortunately did not leave the “secret” recipe for others to use, yet we all are missing these rolls so much while camping there. The final consensus was that the closest resemblance to the rolls we were looking for, is a recipe for Japanese White Bread Rolls, by King Arthur Flour company, and Hokkaido Milk Rolls. Since I “tweaked” these recipes little bit, to achieve the sought after flavor, these may be known as “Mrs. Z’s” camp rolls, and I have no problem with sharing. 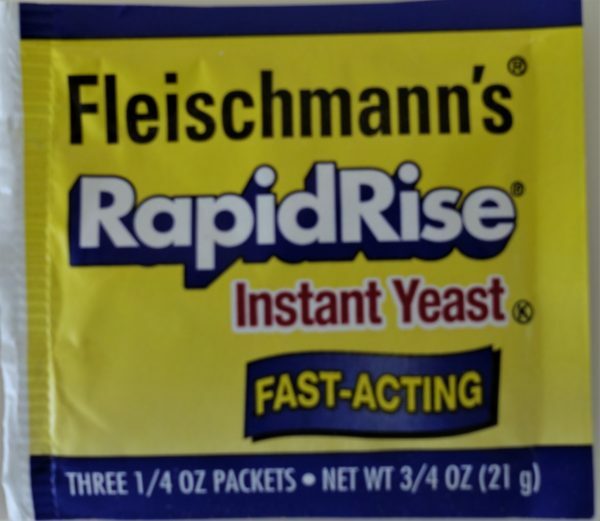 I get best dough rising results from this particular yeast. I used other brands which resulted in disappointment. This is how these rolls look like, after rising in the pan for 40 minutes, just before being basted with egg wash, and ready for baking. They are all baked….and the whole house smells awesome of fresh baked bread…..are you drooling yet???? If you never had these before, I suggest you whip up a batch very soon, and join our club! 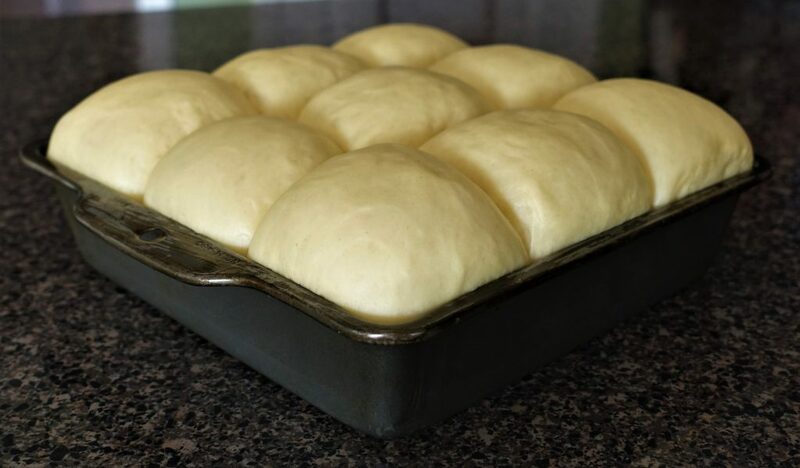 This recipe yields 9 dinner rolls in a 8 x 8 pan, or 12 rolls in a 9 x 9 pan. Update: I recently purchased a 9 x 9 baking pan made by Food Network, and divided the dough into 12 rolls, with same wonderful results. I cut my dough rectangle into 3 even strips, then each strip into 4 even sections, to come up with 12 rolls. Prepare the Tangzhong (the starter). In a sauce pan, add 3 Tbs. water, 3 Tbs. milk and 2 Tbs. bread flour. Cook slowly, mixing constantly, until it begins to thicken slightly, resembling pudding (less than a minute). Remove from heat, and transfer to a dish. Cover with plastic wrap, and cool off to room temperature. In a large bowl, mix the bread flour, salt, powdered milk, dry yeast and sugar. Set aside. In a medium bowl, mix the whole egg, egg yolk, warm milk, melted butter and vanilla extract, then mix in the Tangzhong, until well incorporated and smooth. Use a dough hook to fold in the wet ingredients into the dry ingredients. Change the speed to 4, and mix for another 20 minutes, until the dough is silky and smooth, and not sticking to the sides of the bowl. Place the dough in a greased plastic bowl, and turn the dough over once, to grease it on all sides. Cover it with a tea towel. Keep it in a warm place for 1.5 to 2 hours, until double in bulk. If you let it rise too long, it will collapse and rolls will not be fluffy. Line the bottom of an 8 x 8 baking pan ( I use now a 9 x 9 pan and love it) with parchment paper, then grease well the bottom and sides of the pan. Set aside. Punch down the raised dough, remove from the bowl, knead it few times on a work area, then form into a rectangle. Cut the rectangle into 3 even sections lengthwise, then again into 3 even section width-wise. Create a roll from each piece, by folding the sides under, leaving the top nice and smooth, repeating the process until all 9 rolls are formed. Place the rolls in the prepared baking pan, side by side, leaving a small space between them, . Cover with a tea towel, and again keep it in a warm place for 40 minutes, until the rolls rise above the rim of the pan (see the picture in the post). Prepare egg wash, by mixing an egg with little bit of warm water (or milk, if using only egg white), and brush the tops of the rolls. Bake on a middle rack, for 20 minutes. Remove from the oven, and immediately brush the tops with melted butter. Cool for 10 minutes in the pan, then remove from the pan onto a cooling rack. May cool them completely before serving, or enjoy them while still warm. Thank you for the recipe, I will definitely have to try them as someone who also went to the CYM camps and who also longs to recreate those tasty rolls. The recipe that went around, supposedly was from Pani Tinio, had a lot of problems with it. I was wondering if the powdered milk was a key. Pani Tinio’s alleged recipe also used powdered milk, and I had converted it to real milk. Could that be the secret ingredient? It’s possible, but I am not sure. According to the Japanese recipe, the starter…Tangzhong..gives these rolls the milky taste and the special texture…but I am not sure about that either. I am sure the ladies on Oselia did not use this type of starter….but I am sure they did use the powdered milk, since it was most likely provided to the camp by some type of supplemental aid…???? This recipe is for small rolls, but one can easily divide the dough into 4 sections and have less, but more regular size rolls. I would love your comments after you try them out….all my tasters agreed that the taste and texture of these rolls is very close to the Oselia ones…:-) Thank you for stopping by and leaving a comment. I have a copy of the secret recipe somewhere in my house. She taught me how to make them a few years back. I believe the ingredient you’re referring to is the evaporated milk- she gets a big box of it from Shop Rite- and I think her oven has something to do with the texture also. Ahaaaa….the secret is no longer a secret….LOL….Apparently this recipe is a hot item for CYM folks who used to enjoy these….and now miss them. Hopefully your recipe is not for 1oo people….recipes are so difficult to minimize exactly from huge to small quantities…and baking requires certain amount of precision for a success. Well, if you find it, please share it with all of us. Thank you so much for visiting and leaving a comment. OMG! They were the best!!!! I was from Detroit at the time that I went to camp at Ellenville. That is also where I was introduced to tea with milk but must admit I haven’t had it that way since camp days. I will definitely try this recipe. I used to drink tea with milk as well…I thought it was a Ukrainian costume…but I guess the English drink it that way..now I like warm water with lemon and honey…excellent on an empty stomach before breakfast. I hope this recipe will bring back memories and wake up your Ukrainian taste buds…LOL Thank you for stopping by and sharing a great memory. I have a question in reply to Anon’s comment. She mention’s “evaporated milk” which as I know it, comes in liquid form in a can. Your recipe and the alleged original recipe had dry milk…that is a powder mixed with water. So now, I am curious did original recipe have “dry nonfat milk powder” or “canned evaporated milk”. It matters because of how much liquid is added to recipe. I just added the dry milk powder to the flour and other dry ingredients.I hope this helps. That is what I bought, the dry non fat milk, but got a bit confused when evaporated milk was mentioned by Anon. Thanks. Hope to try soon.